The Olympic torch relay will start on Oct. 7, and the Sochi 2014 Organizing Committee has planned it to be the longest national relay race in the history of the Winter Olympic Games, both in terms of time and distance. Today, the Olympic torch relay is a traditional event that precedes the opening of each and every Olympic Games. However, despite all the tradition, organizers always try to bring a unique flavor to the relay. Russia is no exception. Over 123 days, an in the hands of 14,000 torch-bearers, the Olympic torch will make a journey of over 40,300 miles by car, train, airplane, Russian troika and reindeer-pulled sleigh. By comparison, the Olympic flame traveled 27,900 miles before Vancouver 2010 and 25,600 miles before Turin 2006. Everything will start in Greece—the homeland of the Olympics—where the flame of the 2014 Games will be lit. From there, it will be transported aboard a special flight to Moscow on Oct. 6. On the very next day, the relay will begin, making its way throughout Russia. The journey will take four months and will end on February 7, 2014, at the Fischt Olympic Stadium in Sochi. The route that the relay will take has been designed to ensure that the Olympic flame will visit all 83 regions of the Russian Federation. Leading rock climbers will take the flame up to the top of Mount Elbrus, which is Europe's highest point and the main symbol of the Caucasus. With the assistance of divers, the flame will plunge to the bottom of Baikal—the deepest lake on the planet. The relay torch will be also greeted on the Curonian Spit, which serves as a natural shelter for thousands of migratory birds. The torch will also pass under the walls of the architectural ensemble on Kizhi Island in Karelia—the world-famous monument of wooden architecture. In Kamchatka, the flame will be delivered from the top of Avachinsky Volcano to the foot using five alternative means of transportation. Avachinskaya Bay, the world's deepest natural harbor, will not miss out either. The relay will even pass through Yasnaya Polyana, where Leo Tolstoy created his most famous works: "War and Peace" and "Anna Karenina." In Kronshtadt—a city of military glory and a Baltic navy base—a colorful naval parade will be held for the arrival of the Olympic flame. During the torch relay, media attention will focus not only on the relay route, but also on the torch-bearers. The torch-bearers are the face of the Games and the pride of the regions through which the route of the Olympic torch relay will pass. 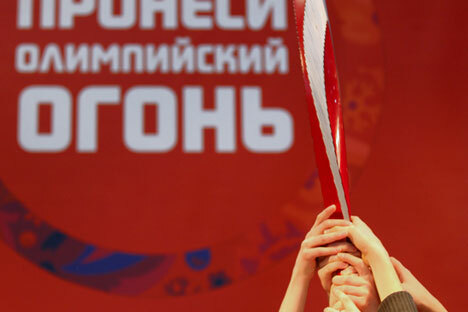 "Only the most deserving have been chosen as torch-bearers of the Sochi 2014 Olympic torch relay, as they have a very important mission to fulfil—to unite the whole country over the course of the long journey by passing the torch from hand to hand," said Dmitry Chernyshenko, president of the Sochi 2014 Organizing Committee. "It will be the torch-bearers who will first ignite the Olympic inspiration that will dominate the Winter Games in 2014," the Sochi Organizing Committee president said. In total, as many as 14,000 torch-bearers will take part in the Olympic relay. In terms of size, this relay is comparable to the Games themselves. Success, to a high degree, will depend on the coordinated work of volunteers, of which there will be about 30,000 for the Olympic torch relay and 4,000 for the Paralympic route. Volunteers will help the torch-bearers at collection points, as well assist in the organization of ceremonies that will greet the flame and other celebrations in towns through which the route will pass. The design of the Sochi Olympic torch has been developed to express a combination of tradition and innovation. It is decorated in motifs from folk tales: The shape of a firebird’s feather is easily read in the contours of the torch. The futuristic form symbolizes innovation and technological progress. The colors of the flame and the cauldron of the Olympic torch are of particular significance: They are supposed to give the effect of “ice and fire.” The silver color is like an icy surface, and, traditionally for Russia, red is a symbol of fire. Incompatible at first sight, they actually combine organically to represent the warm sea and the snow-capped mountains of Sochi. In terms of technical aspects, particularly important was the design of the system that keeps the flame burning constantly. It is fueled by an environmentally friendly gas produced in Russia—propane combined with additives specially formulated to provide a spectacular flame with a bright orange-red color. A special device used in the burner design will ensure that the torch burns steadfastly during strong winds, frost and other possible challenges presented by the Russian winter throughout the relay.